Starring: Christy Callas, Emily Caruthers, Chandler Coniglio, Shae Coniglio, Jim Ewald, Kaeli Fitzgerald, Katareena Gellar, Gary Gustin, Ben Kacon , Marty Krzywonos, Maribel Patino, Jack Pope, Mike E. Pringle, Danielle Leigh Rosenthal and Evelyn Voura. UFAC is an independent Science Fiction Adventure. Set in the present day, the story centers around The JF (The James Foundation), a team of science detectives that meet and deal with aliens. The first film shows the origin of the JF, how they came together and their first adventure. The earth based JF is made up of humans, aliens and automatons. UFAC begins with a television movie trilogy. It will continue as a series. The first film is now in post-production. The next two films are set for early 2008. UFAC already has two worldwide video distribution offers. They will start on regional television. The producers hope to acquire sponsors. This will increase the production value. UFAC is produced by Ikuzo Studios and Who Survives Productions. Past productions include Death From Beyond 1 and Merc Force. Merc Force was featured at the 2004 AFM (American Film Market). Over 400 movies were featured and Merc Force was ranked #16. Are you ready for a Change? Because Change Is Good! 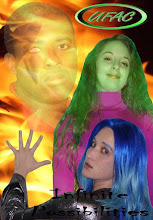 Prior to the filming of UFAC, Ikuzo Studios and Who Survives Productions filmed a short called “Unearthly Exchange”. This sci-fi comedy was a lot of fun to make. The end result is quite a charmer. See it for yourself. Unearthly Exchange is now on Amazon’s VOD (Video-On-Demand) to own for only $1.00. So please order this short piece and show us your support. 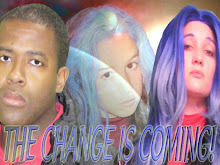 For more information on Unearthly Exchange visit the MySpace page and IMDb. Destiny - The Vampire Mermaid created by Ronn Foss & Dennis Druktenis. Brought to life by Debbie D meets the James Foundation? 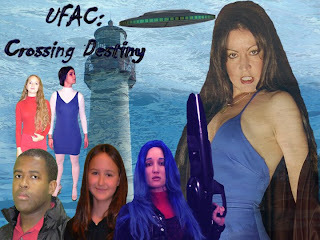 The first season of UFAC includes the episode “Crossing Destiny”. 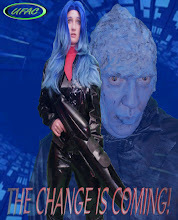 Destiny (Debbie D) is accused of murdering someone by an evil alien visitor. He enlists the JF to take her out. What happens when the JF uncover the alien’s true intentions? It’s a cross over story that will open doors to future Destiny guest spots. Then possibly spearhead a “Destiny – the Vampire Mermaid TV Series”. The Edge of Infinity will be a spin-off series of UFAC. Infinity Station was built and equally run by several free worlds. Infinity’s mission is to teach the youth from several alien worlds. This also includes anyone from earth who chooses to live on Infinity and keep her secrets. The Edge of Infinity Series is set in the UFAC Universe. It also has the same time line, the present day. Several minor characters from the UFAC Series will crossover to Infinity and be its stars. Infinity will of course feature many heroes and villains from the UFAC Series as guest stars.